Off the track, Fernando Alonso is an accomplished magician. On the track, he puts similar skills to work it seems. And he put all of his conjuring abilities into action today to win magnificently, and against the odds, in the Malaysian Grand Prix. Make no mistake about it, this was a victory that owed to Alonso's performance rather than to that of the F2012. Yes, it was a wet-to-dry race, and on a dry day the McLarens would have likely ran and hid, leaving Alonso to limit the damage points-wise in the wake of the McLarens and Red Bulls, possibly even in the wake of the Mercedes and Lotuses. But cars that lack grip in the dry usually also lack grip in the wet, and Alonso was at the top of his game and immaculate in coming home first today. He had to be, and the occupant of second place pushing him all the way was even less likely than Alonso himself: Sergio Perez in the Sauber putting in one of those star-is-born drives that happen but rarely. A bold call early on, being the first to switch to full wets at the end of the opening tour, brought Perez right into the front running mix, where he stayed. Indeed, he was the quickest guy out there in the second half of the race, and looked a likely winner as he hunted down Alonso in the latter part. Unfortunately, two doses of old-style Sauber caution hampered his cause. He was kept out a lap longer than seemed necessary before switching to slicks, which lost him several seconds to Alonso, and after he'd clawed the time back his radio crackled and Checo was told: 'be careful, we need this position'. Perez didn't seem to pay heed, but did run wide at turn 14 shortly afterwards, which gave Alonso vital breathing space and the final result was thus set. There was some inevitable conspiracy talk to the effect that Sauber, who are close to Ferrari politically and use Ferrari engines, were guaranteeing a Ferrari win for whatever reason. I don't buy that for a second. Midfield runners are often cautious when big points hauls are at stake, and Sauber with respect have been especially cautious for as long as I can remember. It's often a blessing to them, but on days like today when aggression was called for it is in many ways a curse. Still, points win prizes in F1 and the 18 of them won today for Sauber will be extremely valuable. It was a race of two parts. Rain started in the minutes before the start and the first part started in conditions suitable for the intermediates, but the rain came down harder from the first lap onwards and most soon pitted for full wets. Then the red flag was thrown on lap 9 as the rain continued to intensify. Alonso was in P5 at this point, but passed Webber immediately at the restart, and then managed to leapfrog both McLarens as everyone pitted for inters shortly afterwards with the track now drying (helped by a slow stop for Hamilton). Alonso then passed Perez after he emerged from his stop for inters a lap later. Few saw the significance of this at the time, but it was a lead ahead of Perez at the front that never was overturned. Alonso now, astonishingly, leads the drivers' table. But both Alonso and his team principal Stefano Domenicali are absolutely correct that it changes nothing in terms of where the F2012 is in the normal scheme of things. One thing it does change though, is that if the F2012 can be got right then they are in a better place to win the title than they would have been without the win today. Perez's drive to second was given an extra edge as Felipe Massa's future in the Ferrari seat continues to be in focus. The focus sharpened further today, as Massa had another difficult run and ended up finishing back in P15, some 97 seconds after his team mate. 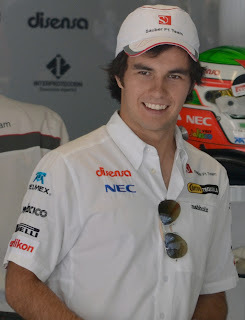 Perez is a good bet for a Ferrari drive in 2013 after Massa's contract expires, and today's events shortened the odds of that happening, and even of that decision being brought forward. In wet, and wet-to-dry, conditions the McLarens are usually the guys to watch. But their pace in the dry was washed away in today's rain. Lewis Hamilton nevertheless put in a sensible and level-headed drive to come home third for the second time in a week. But Jenson, atypically, had a scrappy run, first of all driving into Narain Karthikeyan in a move that wasn't on, necessitating a front wing change, then failing to make his next set of tyres work and pitting again early (and sounding rather pained over the radio while all of this was going on). If you're being harsh you'd say it was almost like the two of McLaren pilots had swapped cars for the day. But it was a good drive from Lewis, and all of a sudden he looks in a good place in the championship. 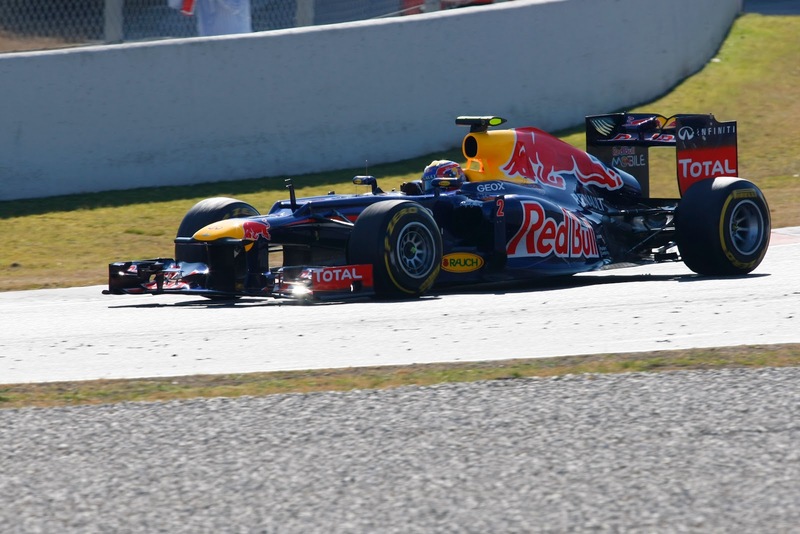 Mark Webber put in a similarly solid drive to come fourth, and thus continued his good 2012 form. 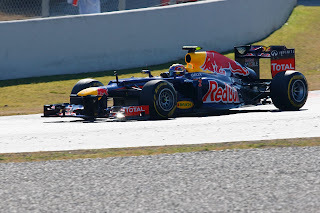 His stable mate Sebastian Vettel had a frustrating time of it, puncturing a tyre against Narain Karthikeyan's HRT. It looked to me that any blame to be attributed was Vettel's in that he moved onto Karthikeyan's line way too quickly upon overtaking, almost like he expected the HRT to disappear. That it was Karthikeyan that was penalised (with a 20 second penalty) struck me as absurd. I hope it wasn't a case of the stewards picking on the little guy. Vettel finished out of the points, in 11th, but still provided a bit of fun on the last lap as he appeared to receive rapid-fire contradictory messages from the pitwall about whether he should stop or not (due apparently to a brake problem). It's probably an even longer road back for Ferrari and Alonso to lead the pack on a clear day, but they seized their opportunity brilliantly to limit, and reverse, their championship damage today. For an Alonso fan it was a stressful race to watch! Found your blog by accident but I am now following! Nice report. Think you are right, the Ferrari is probably closer to where Massa puts it then Fernando. Thanks very much for following Karina! Hope you like the blog! Good point made there on Felipe Massa. When judging his performances we've got to take into account that the F2012 is a difficult machine, and that Alonso seems to be performing minor miracles with it (thanks also for your kind words!). Good article as always Graham. I think if Perez didn't make some rookie mistakes of trying too hard he would have won. Alonso drove smart and didn't make any mistakes. Now it's on to China. Another day, another race. We can only hope it is as exciting. Thanks very much Michael and Ian for your thoughts and for your compliments. Yes, it's probable that Perez would have won without the error at turn 14, though you could say it's also probable he would have won if the team hadn't kept him out on slicks a lap too long. You could argue that both driver and team showed their inexperience of running at the sharp end. Still, it's true that Alonso being error free was crucial to his victory - one slip and Perez would have been ahead. Lots of people have said that the Malaysian race couldn't have been worse for Felipe Massa: his team mate won, he finished 15th 97 seconds down, and the guy who's been tipped to replace him at Ferrari put in an excellent drive to come second! Maybe after this things can only get better? !